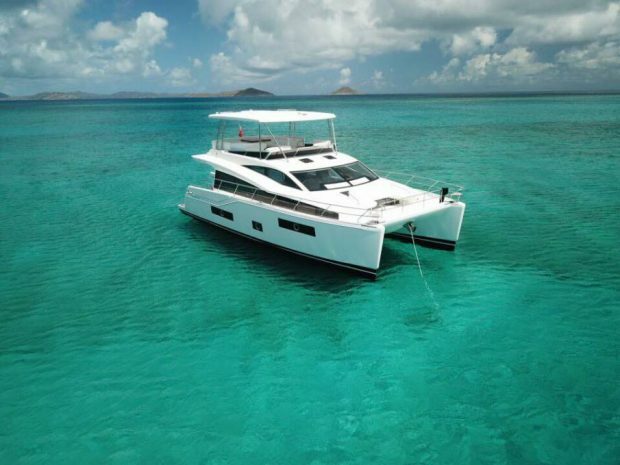 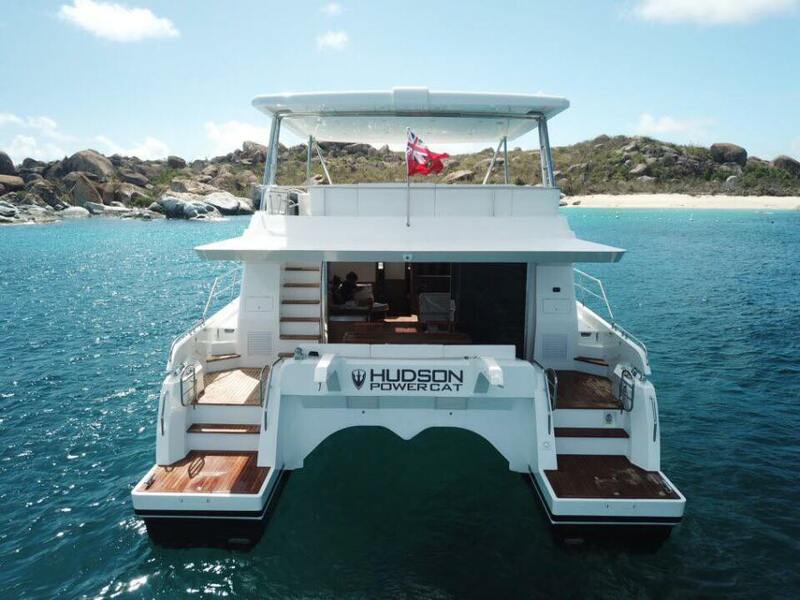 Length 48' | Beam 22' | Draft 3'10"
‘Purra Vida’ the Hudson HPC48 power catamaran conveys a level of luxury and style never before offered to bareboat charter guests in the BVI. 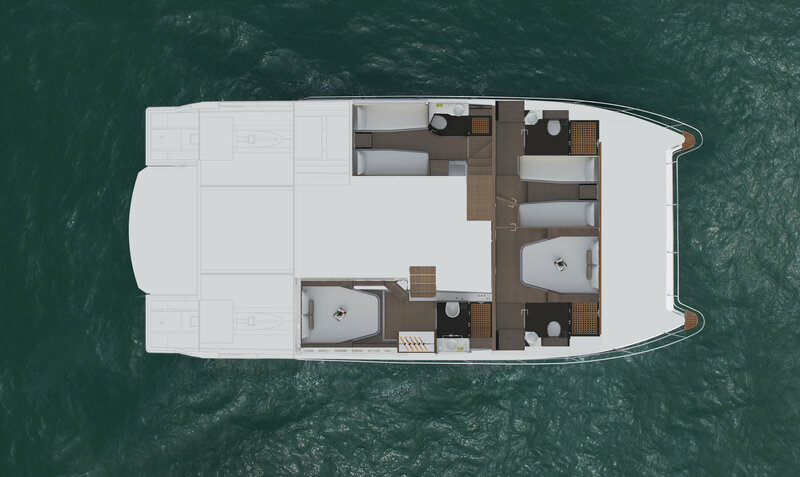 Custom designed to provide guests with total comfort and stability both at sea and in the harbor! 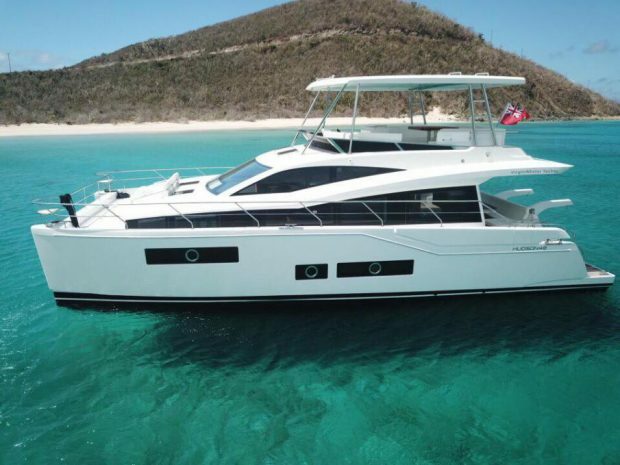 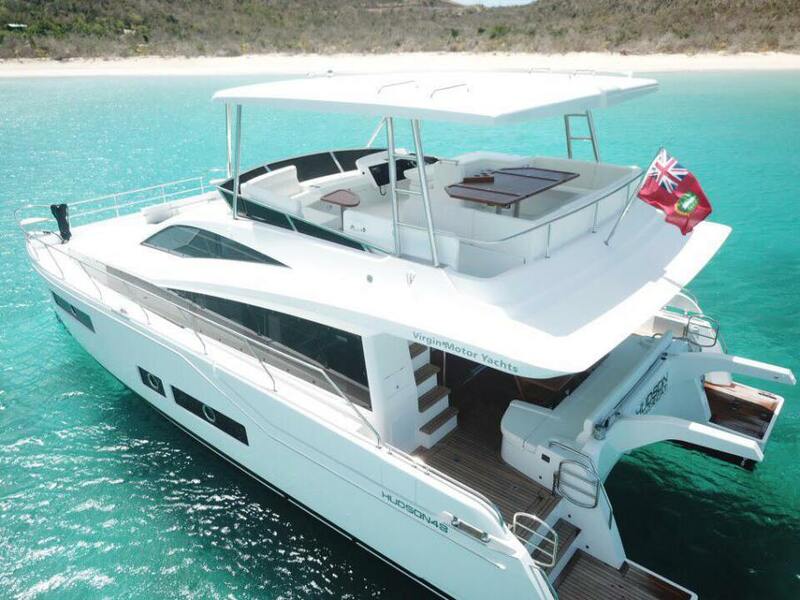 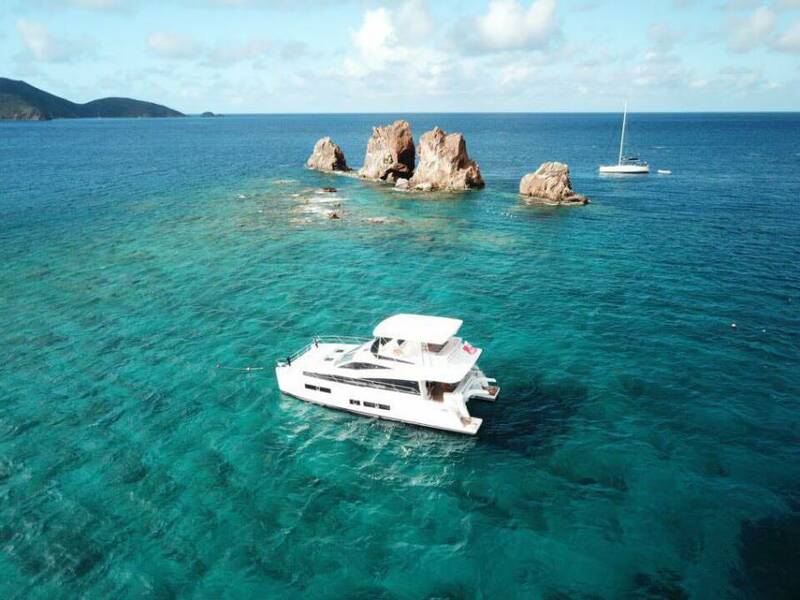 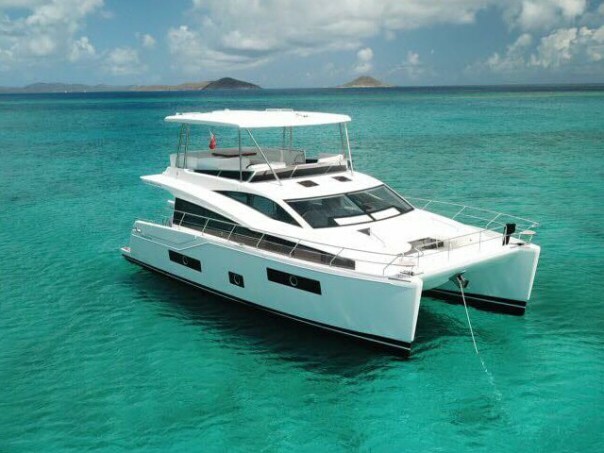 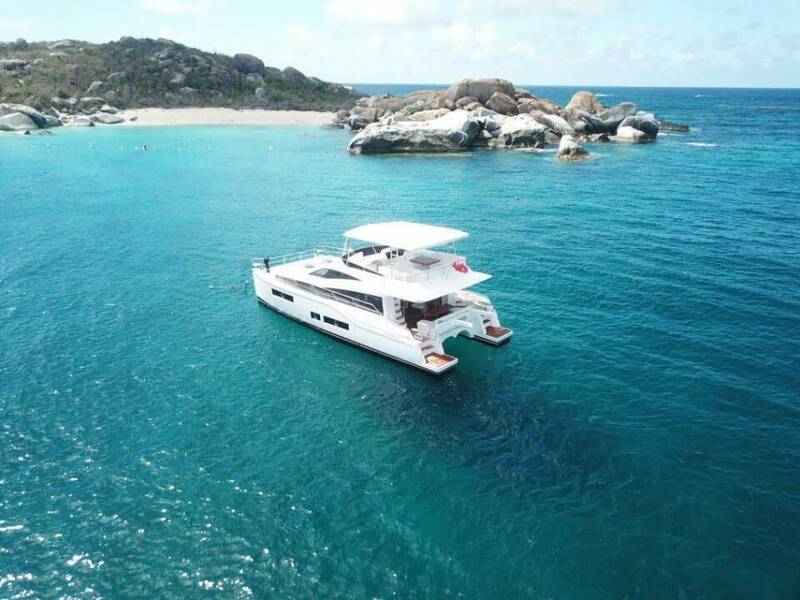 ‘Purra Vida’ the Hudson HPC48 power catamaran coveys a level of luxury and style never before offered to bareboat charter guests in the BVI! 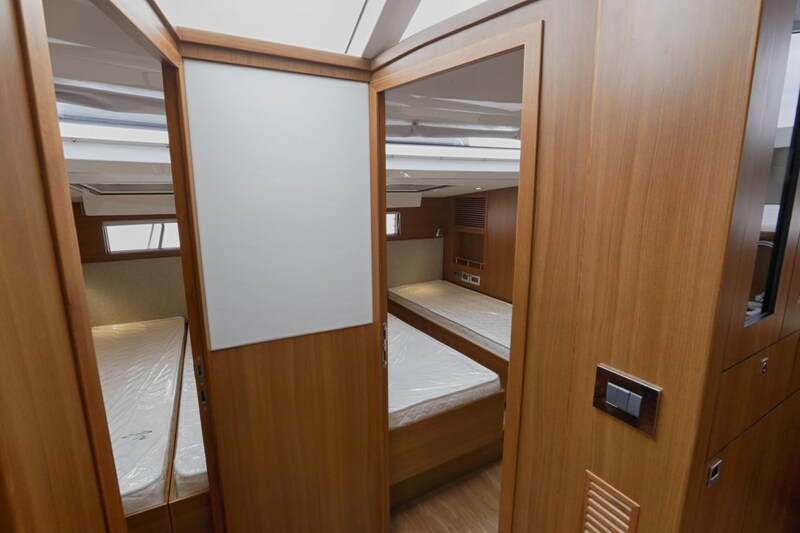 Boasting large wrap-around saloon windows, modern spacious interiors and four beautifully furnished cabins, this catamaran is your luxury apartment on the sea and your venue for entertaining guests. 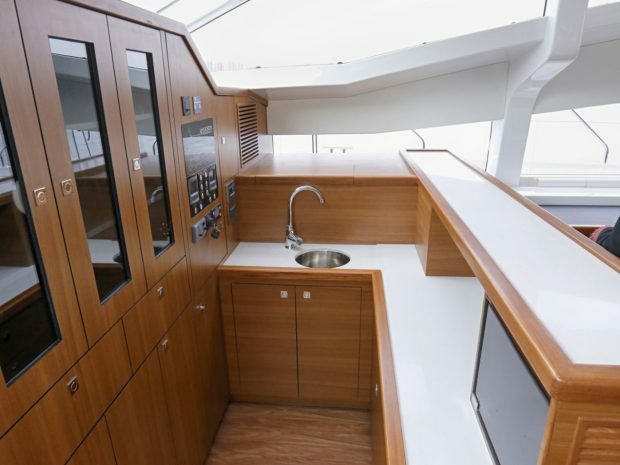 This is your perfect floating holiday home! 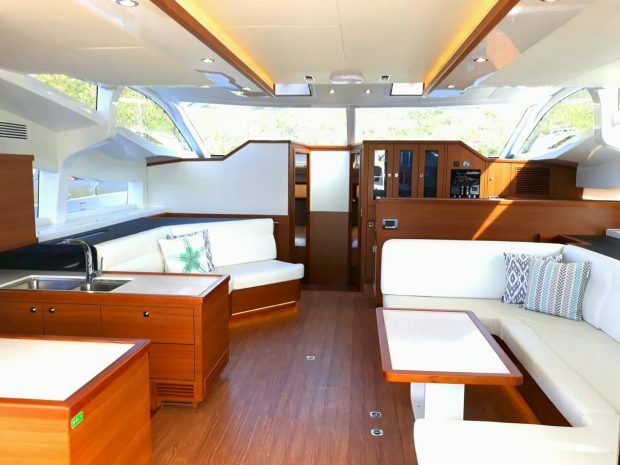 The flybridge on the HPC48 offers an immense amount of outdoor space with more than enough room for your entire group to sit back and relax. 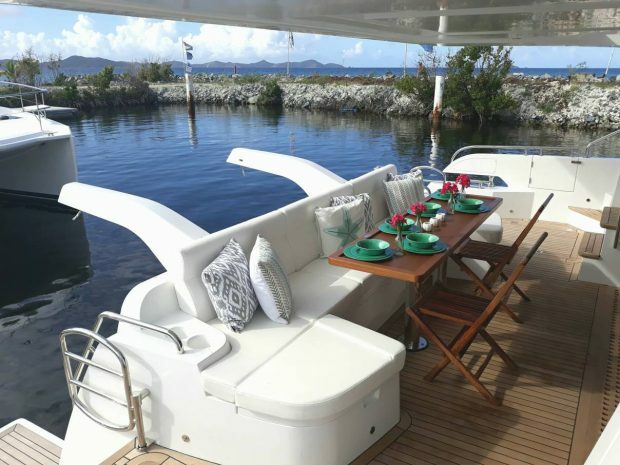 The flybridge has been fitted with a huge fold out dining table to accommodate your entire group for al fresco dining. 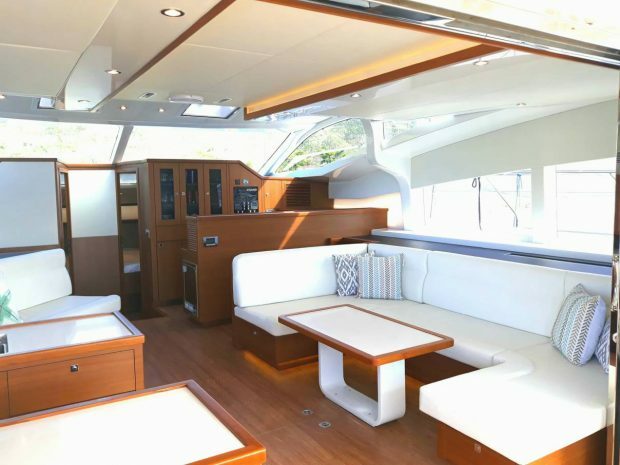 A wrap around sofa extends the entire aft with an additional seating area next to the helm – all perfect for relaxing with company whilst taking in the 360 degree ocean views. 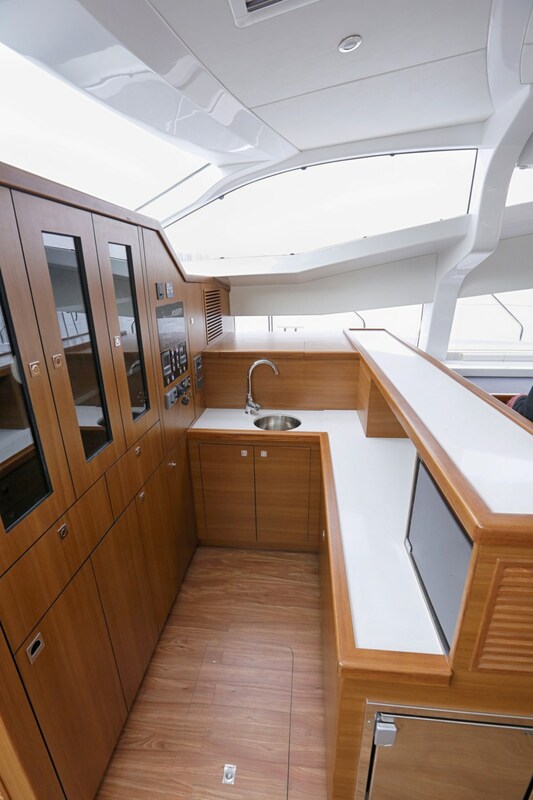 The flybridge is complete with built in wet bar with fridge, electric grill and sink to prepare the perfect painkiller or burger while out at sea. 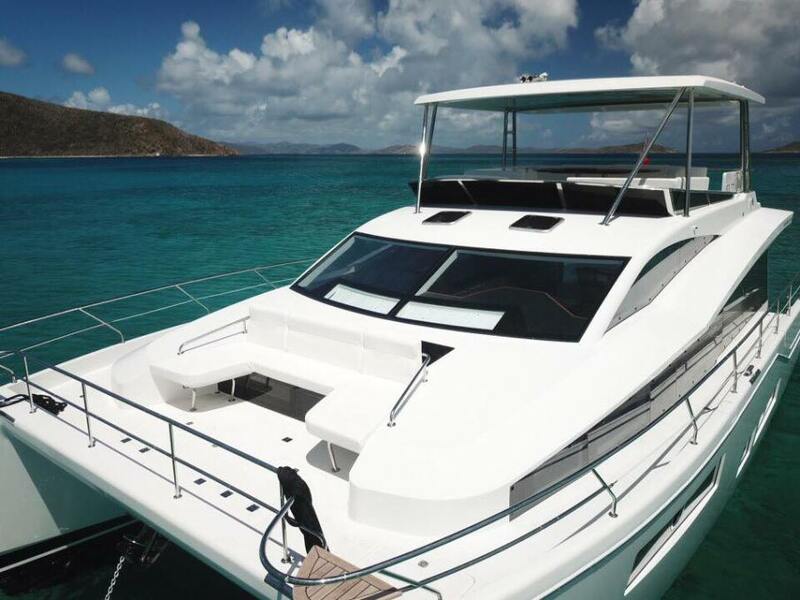 The entire area is covered by a huge hard top, perfect for keeping you comfortably shaded while cruising around the beautiful BVI. 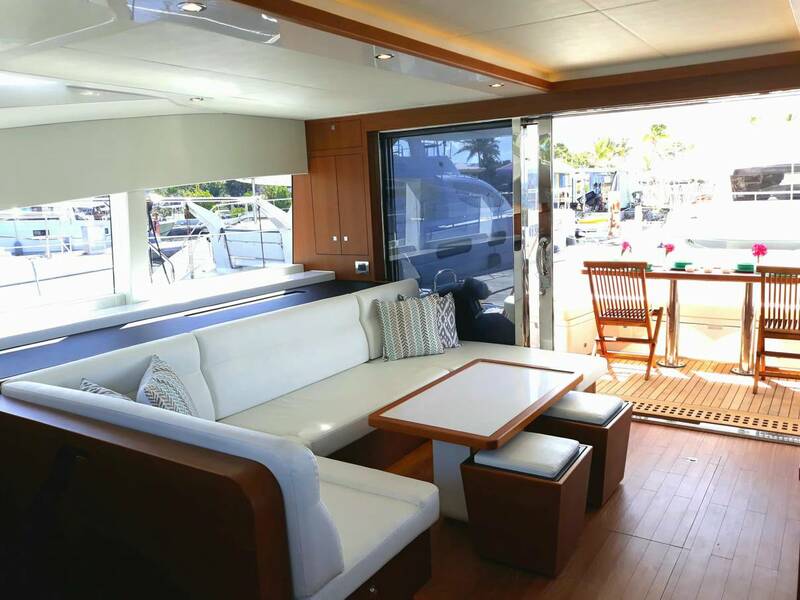 Perfect indoor outdoor flow is created with the large triple panel patio doors which open from the aft deck into the saloon, perfect for taking in the island breeze and scenery. 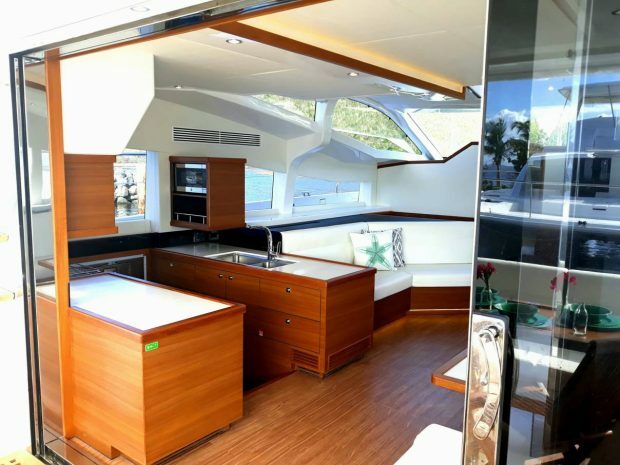 The enormous wrap around windows provide an abundance of natural light, creating interiors which always feel roomy and bright. 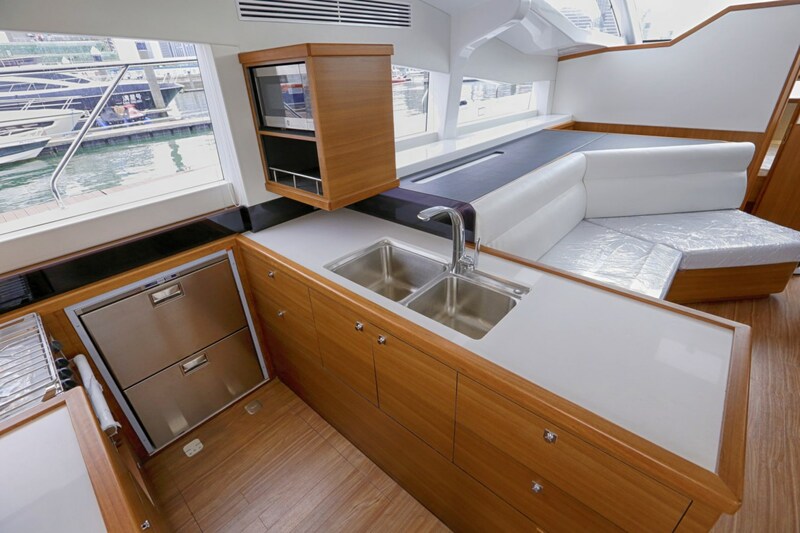 Aft is a large wrap around sofa with full length fold out dining table, conveniently placed just aft of the galley for easy preparation and serving of meals. 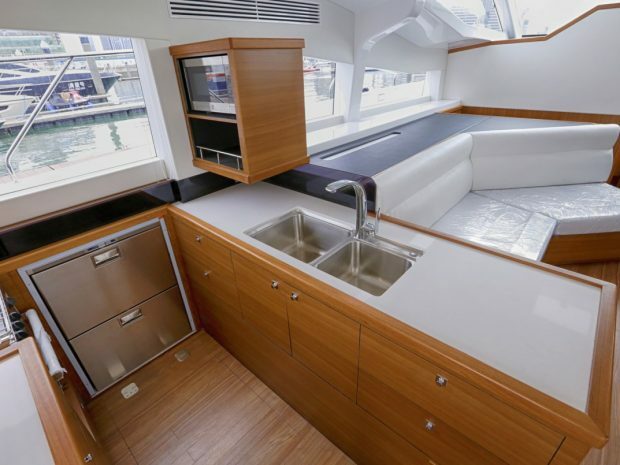 Purra Vida features a modern galley aft, perfect for creating and serving meals to guests relaxing on the aft deck. 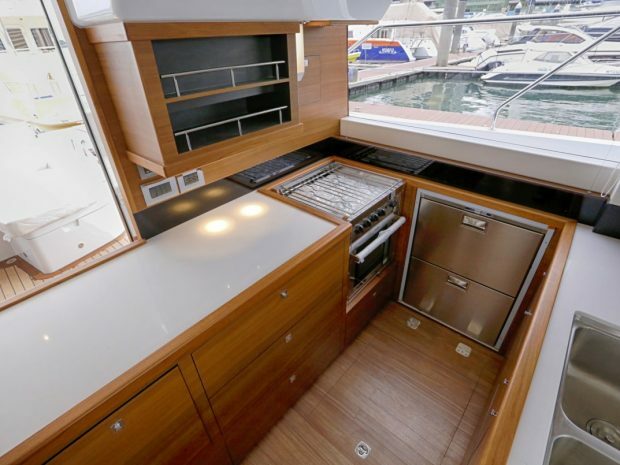 The galley boats large fridge and freezer drawers, stove and oven, microwave and lots of storage space for all your provisions. 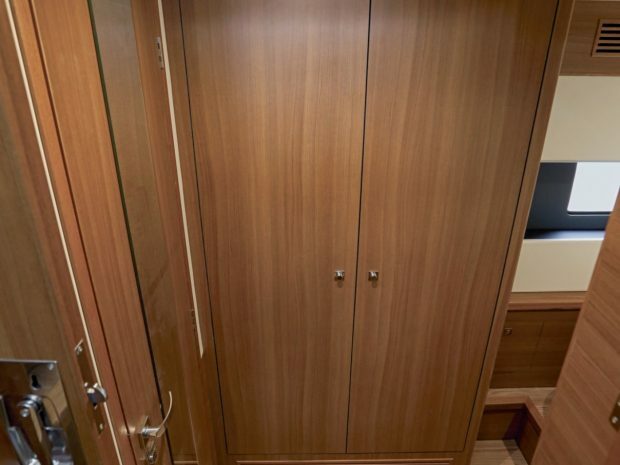 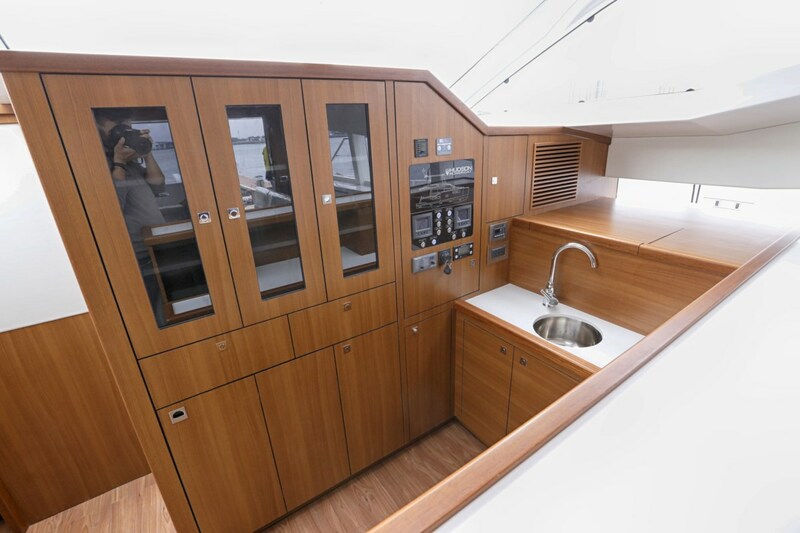 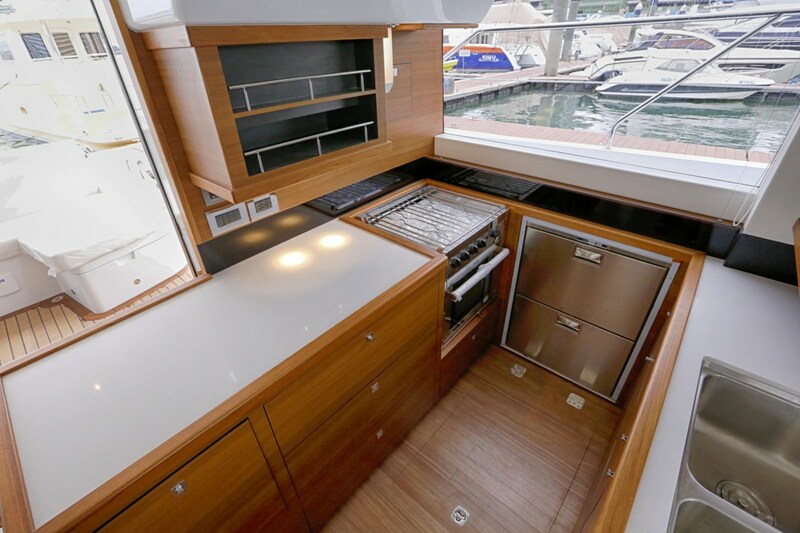 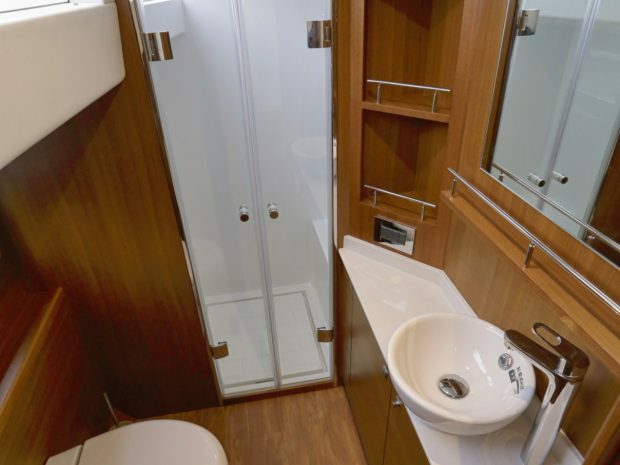 In addition to the galley, Purra Vida also is uniquely configured with an interior wet bar, complete with an ice & water maker, sink and lots of extra storage space for all the drinks and provisions you can supply! Purra Vida offers a 4 cabin, 4 head en-suite layout which can accommodate 8 guests in comfort. 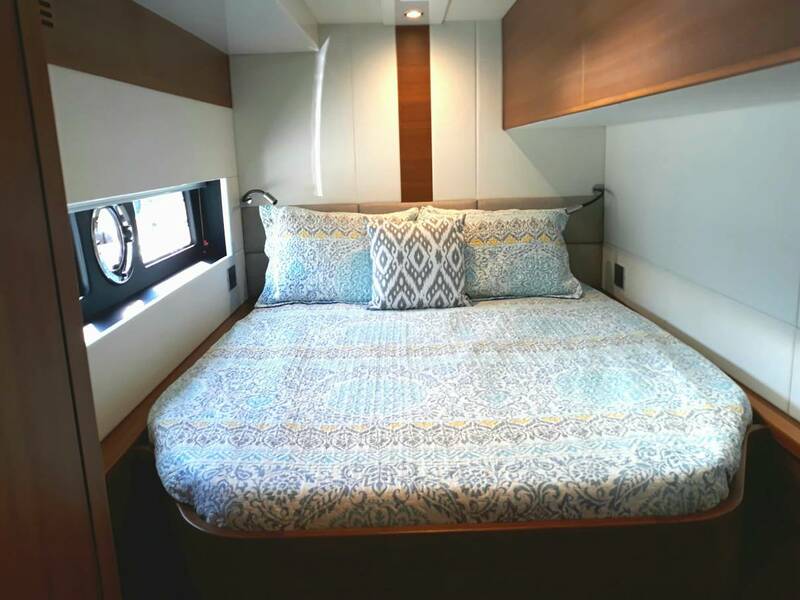 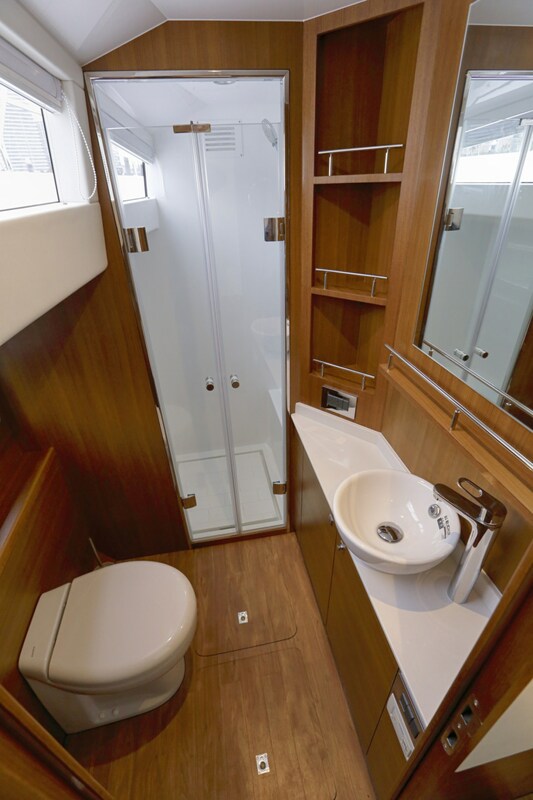 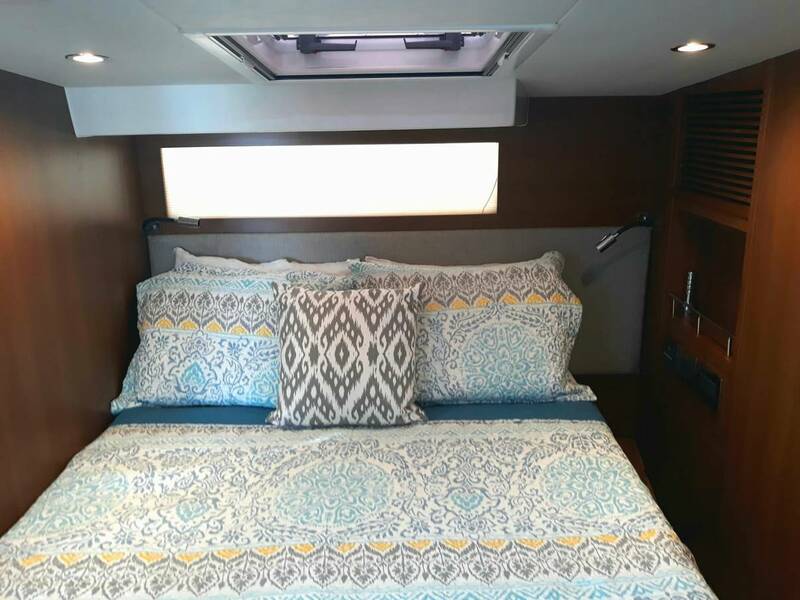 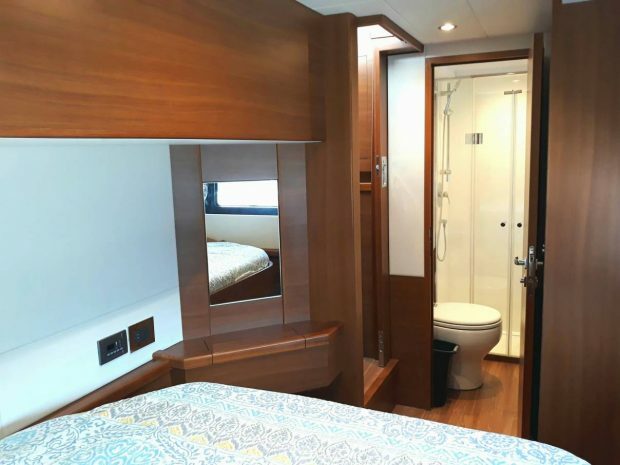 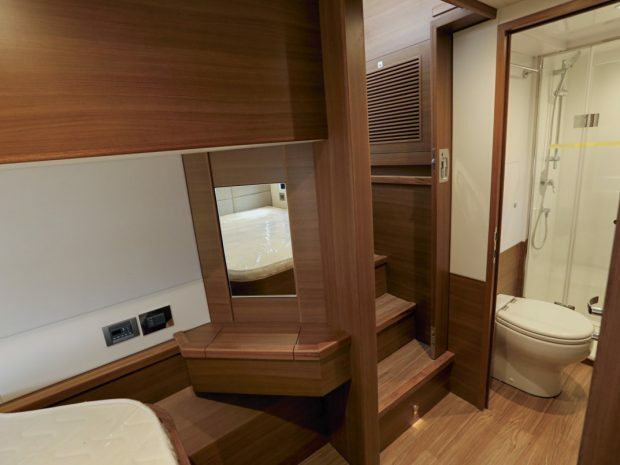 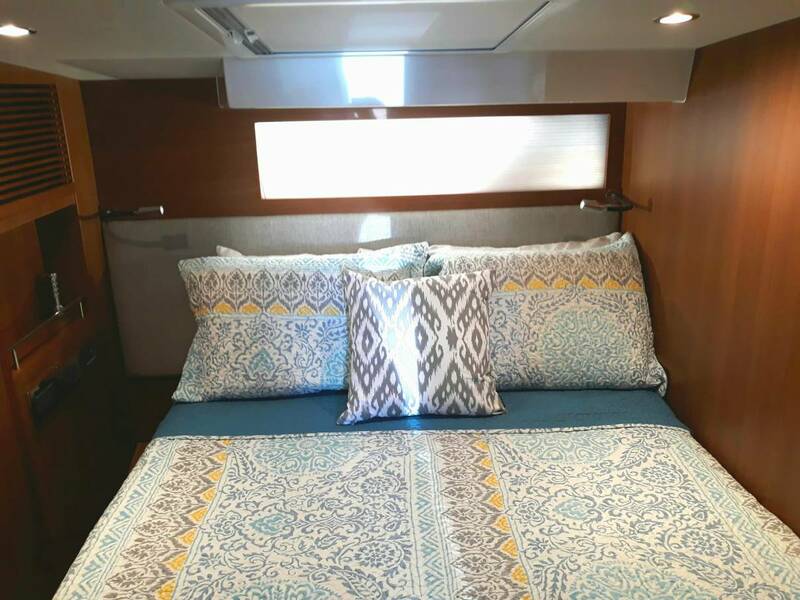 The HPC48 layout is unique, with two on-deck cabins forward; each with en-suite heads and showers. 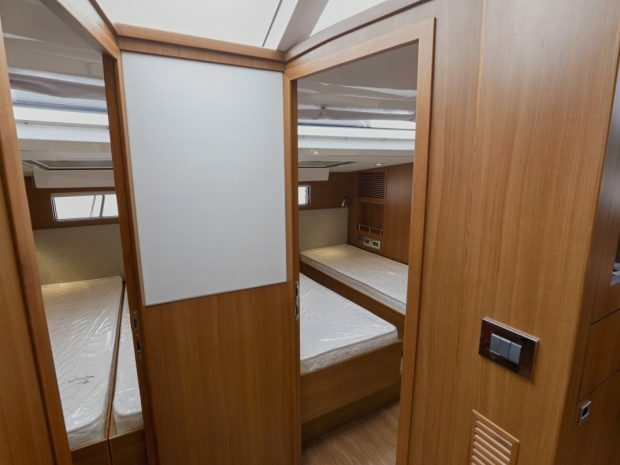 These cabins offer lots of natural light given their location on the main deck. 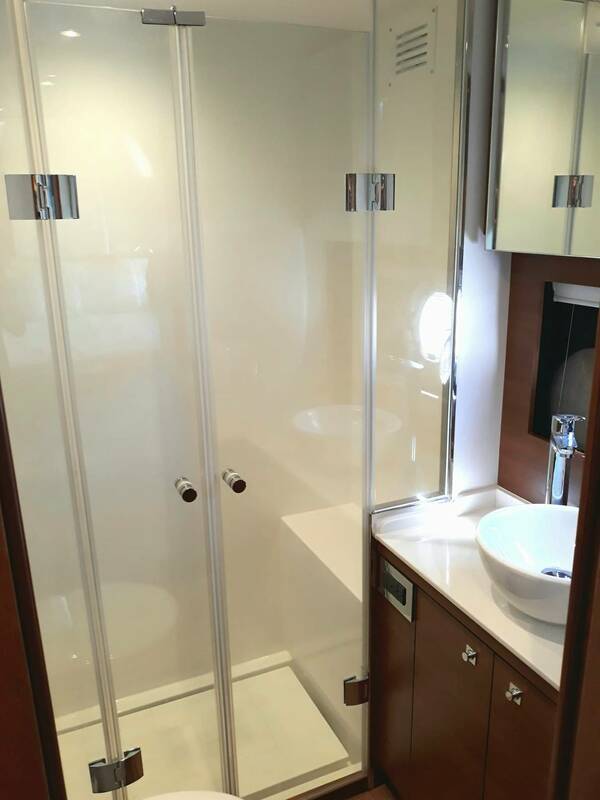 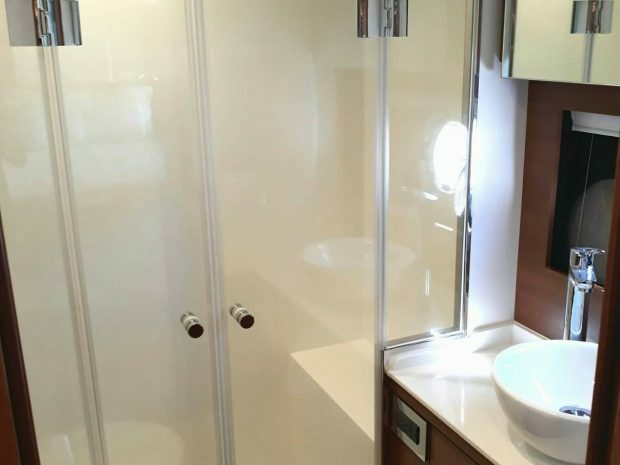 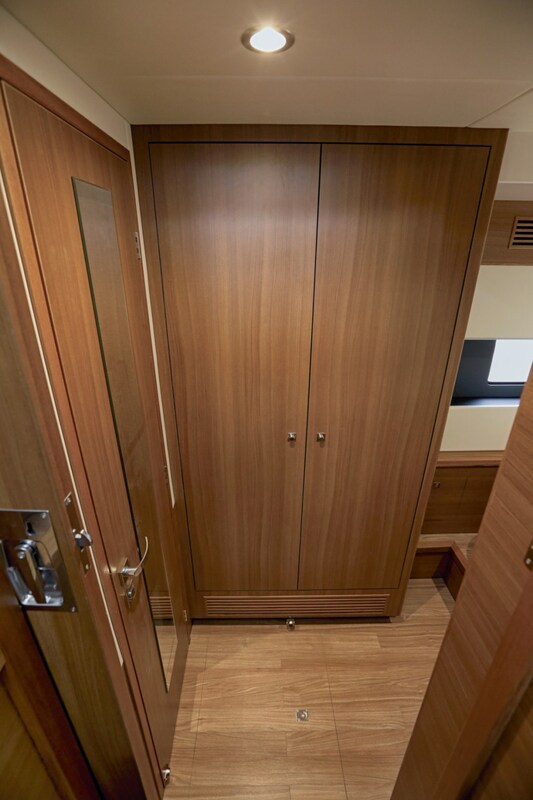 The starboard hull features a double cabin with ensuite head and shower and there is a fourth cabin and en-suite head in the port side hull. 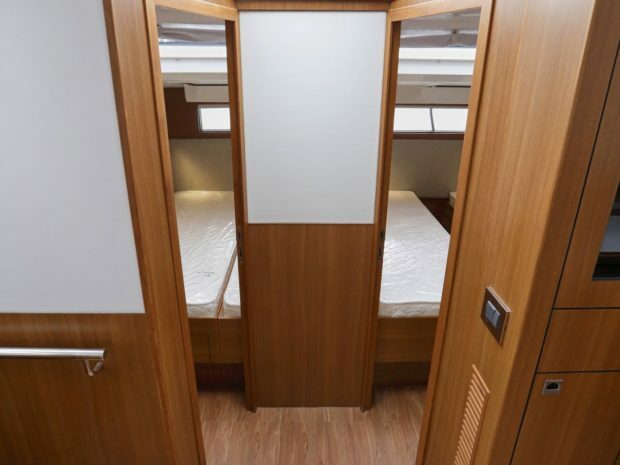 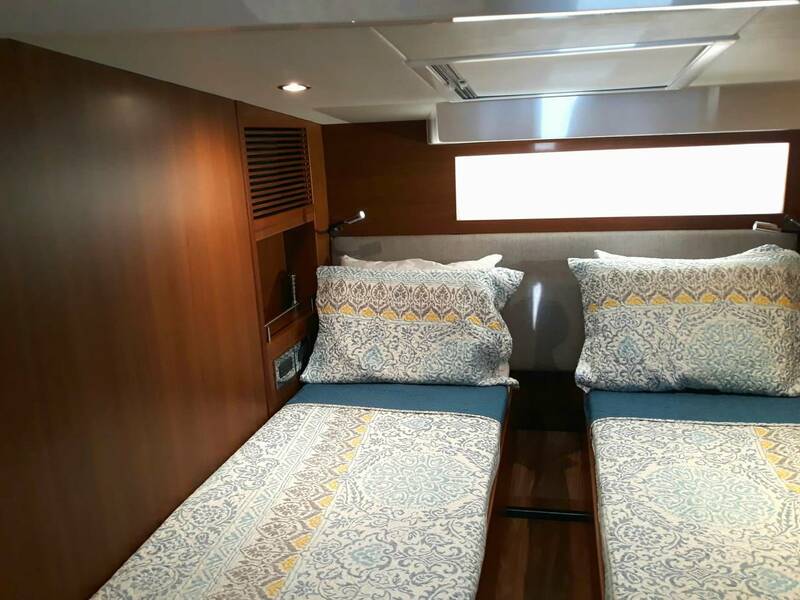 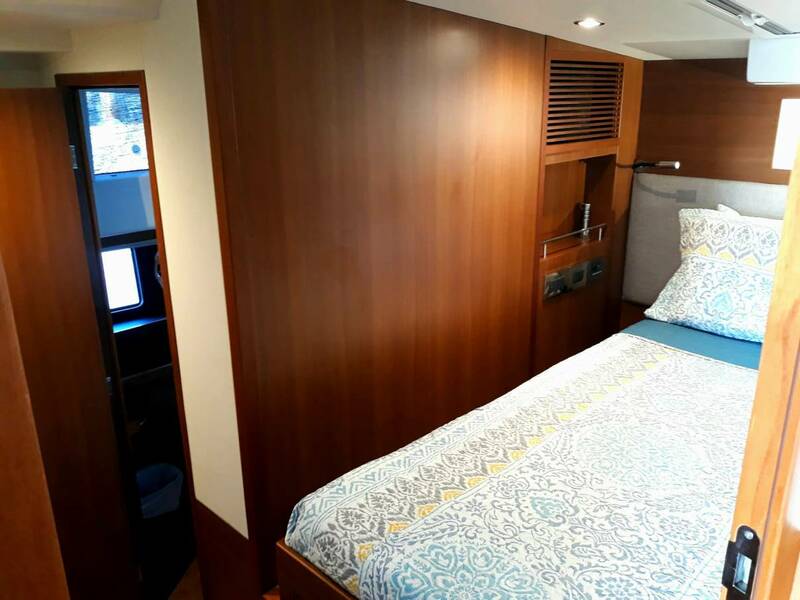 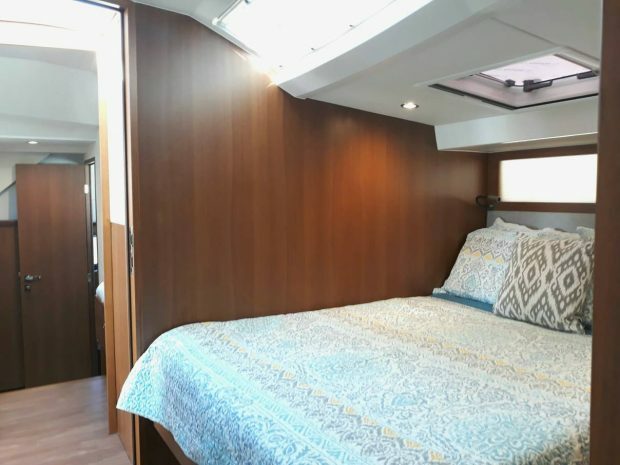 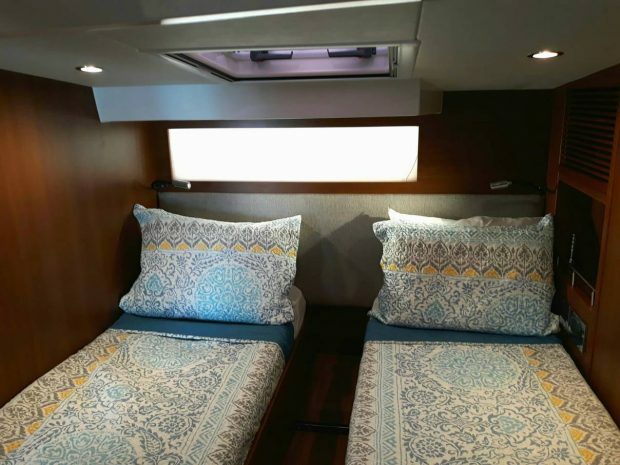 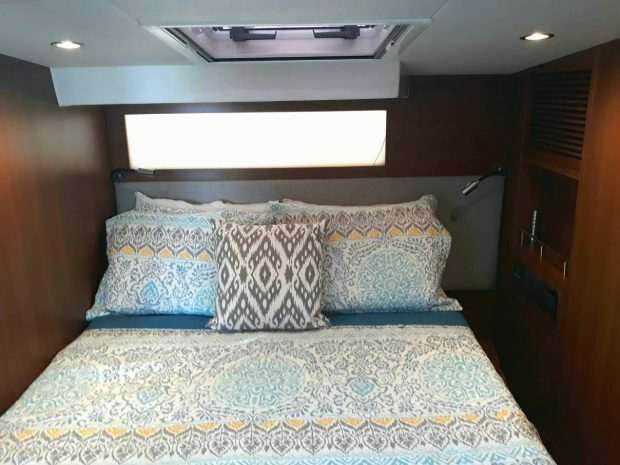 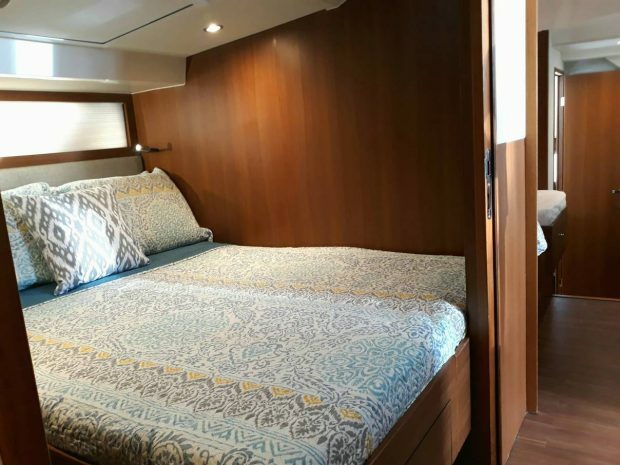 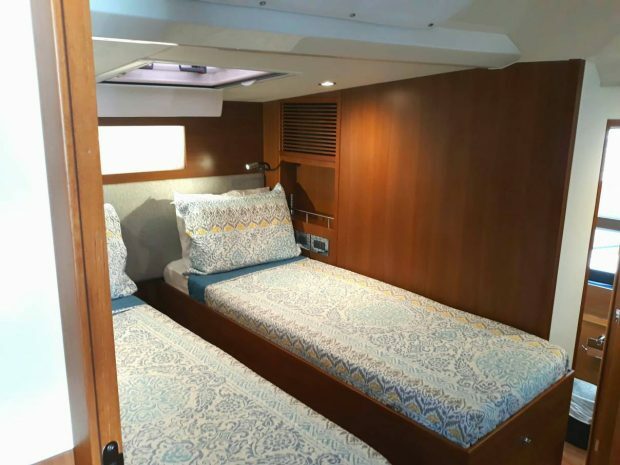 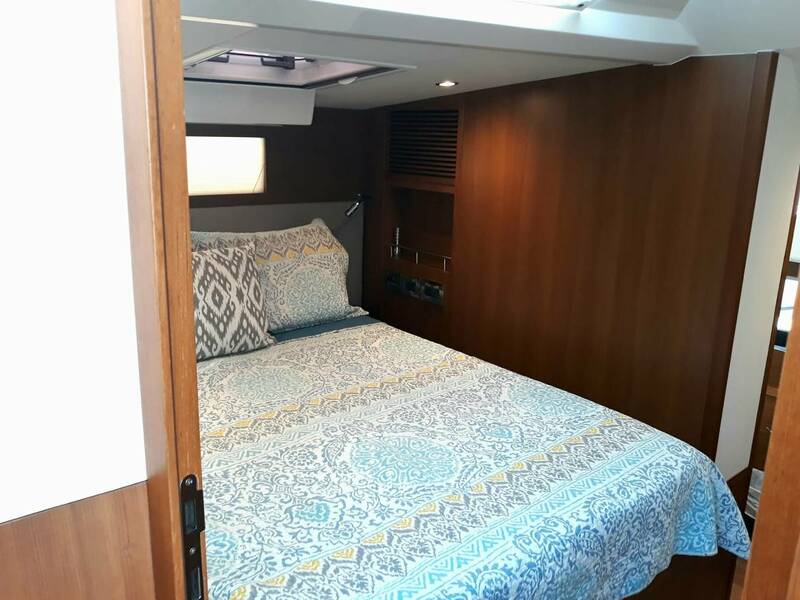 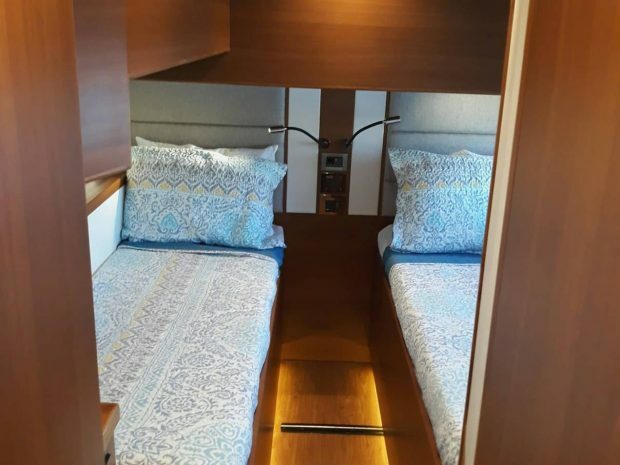 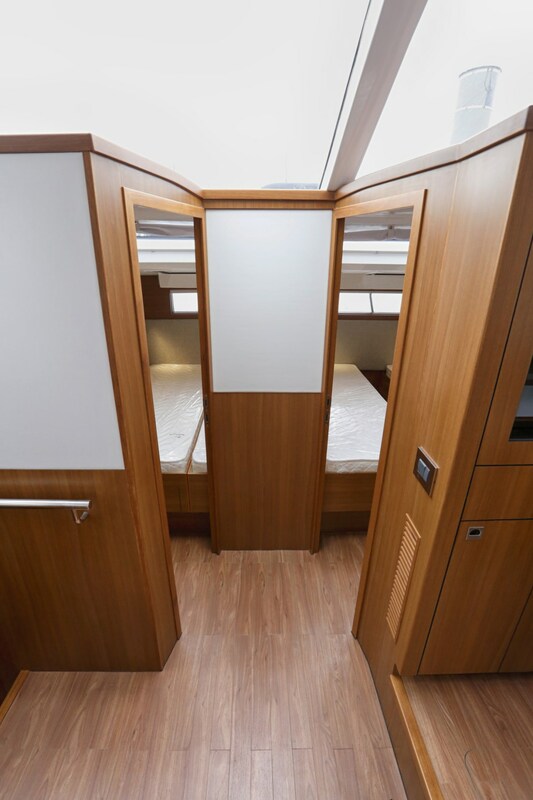 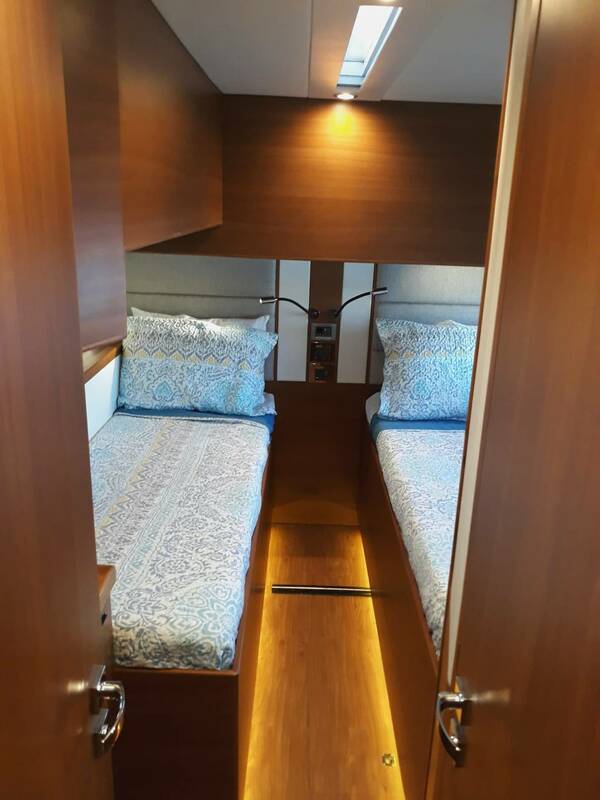 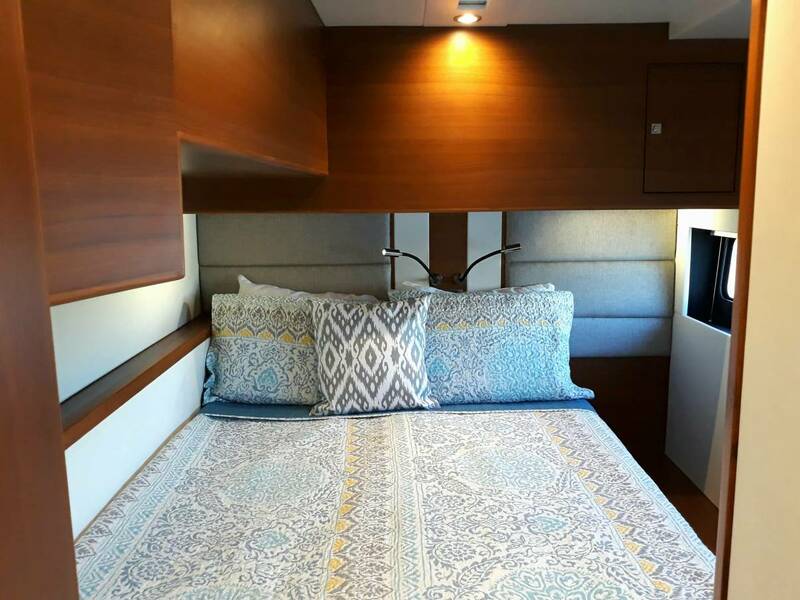 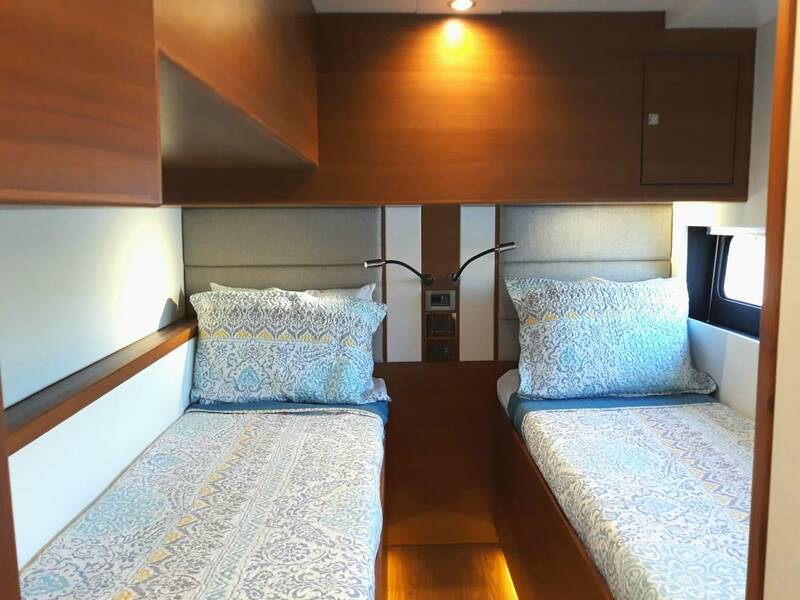 The starboard side cabin is a permanent double, and the other three have the ability to be configured as a double or as two singles if preferred, as the beds are on an easy-to-operate, sliding tract system. 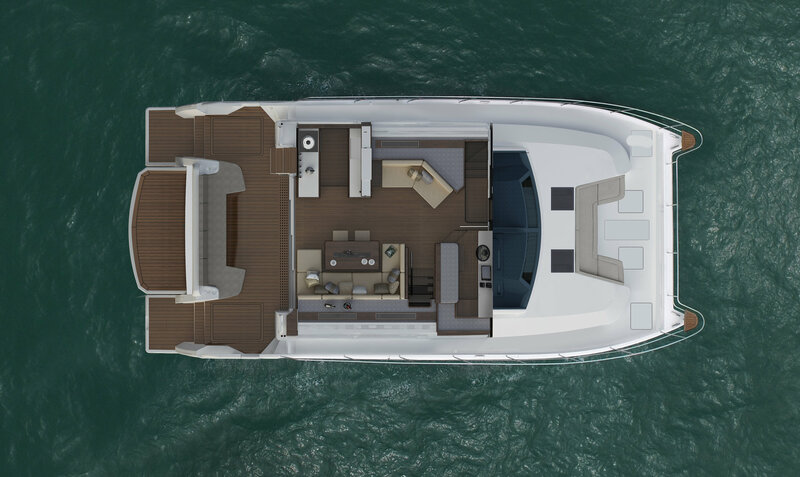 Follow the wide, walk around decks on both side of Purra Vida forward, to the best seat in the house. On the bow is a comfortable, built-in couch, perfect for catching some rays and enjoying a cocktail while relaxing on a mooring ball and taking in the unobstructed island views. 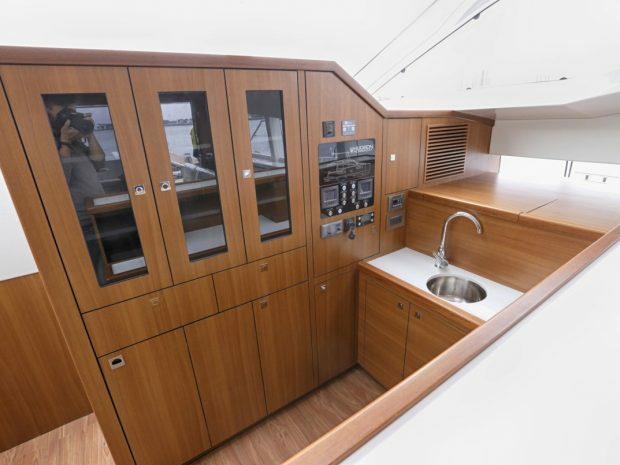 The Hudson HPC48 is powerful, safe and simple to helm. 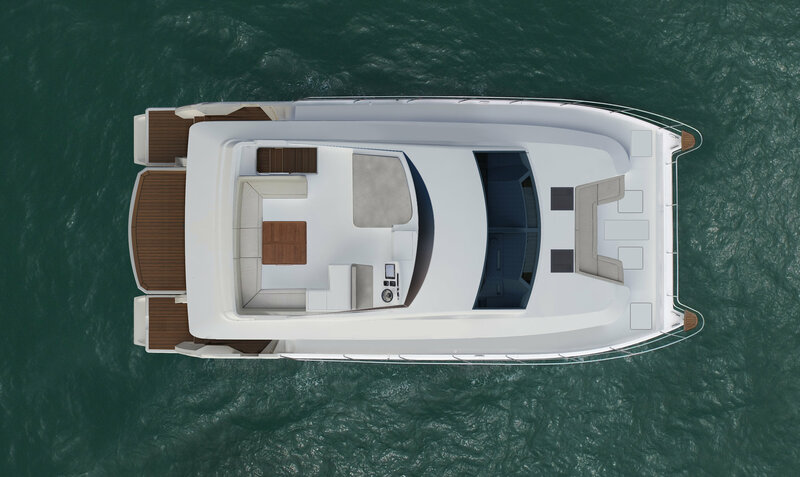 The twin Yanmar 370hp engines allow you to cruise in speed and comfort. 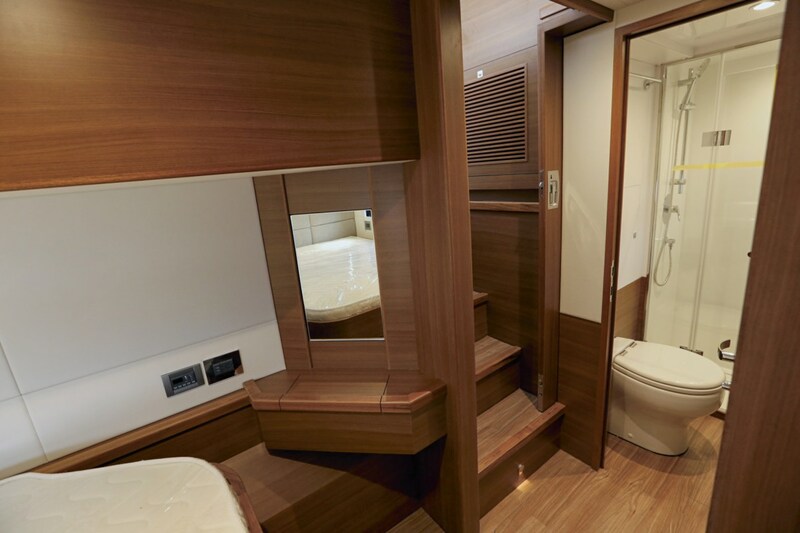 Purra Vida offers a bow thruster to make docking a breeze. 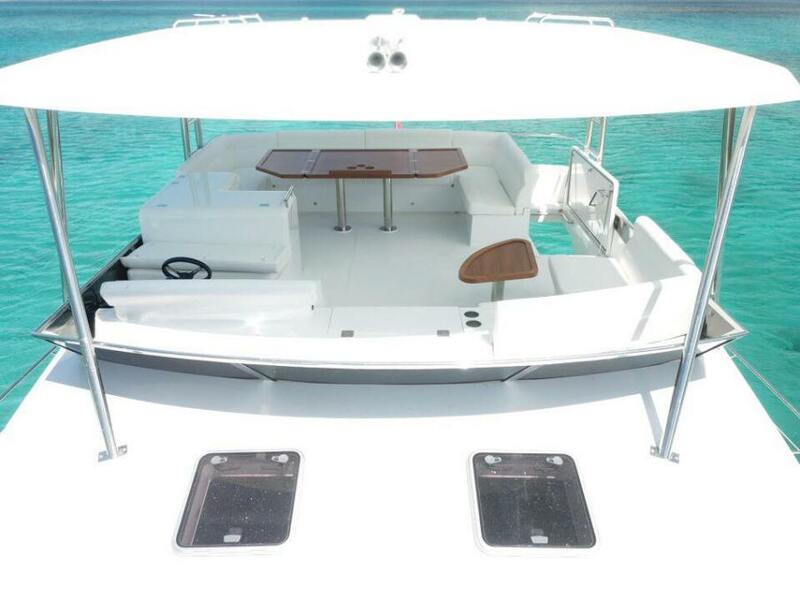 A davit system aft allows guests to travel with the dinghy raised out of the water or towed, if preferred. Purra Vida was custom designed to offer our guests total comfort and stability both at sea and in the harbor!